26 May 2007 (The Jakarta Post) – The island of Nias in Sumatra, Indonesia is to be recommended for inclusion into the UNESCO World Heritage site list. 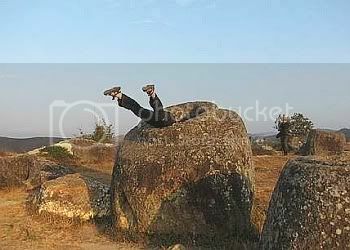 Nias is noted archaeologically for its megaliths. The central government will support a bid to include Nias Island, in North Sumatra, as a world heritage site. Representatives from various organizations, academics, researchers, the government and members of the general public attended a meeting Friday in Medan, North Sumatra, to discuss the bid. The meeting was organized by the United Nations Educational, Scientific and Cultural Organization (UNESCO) in cooperation with the Culture and Tourism Ministry, the United Nations Development Program (UNDP) and North Sumatra University. Head of the World Heritage Center’s working committee, Risman Musa, said Nias had a good chance of being listed as a world heritage site, due to its unique cultural heritage. The island boasts traditional houses which date back hundreds of years, megalithic sites and artifacts, traditional villages, a variety of local languages, special handicrafts and traditional architecture. Read more about the bid to name Nias Island as a World Heritage site. You might have heard of Nias Island from the 2004 tsunami, where it was hit hard because of its location near North Sumatra. 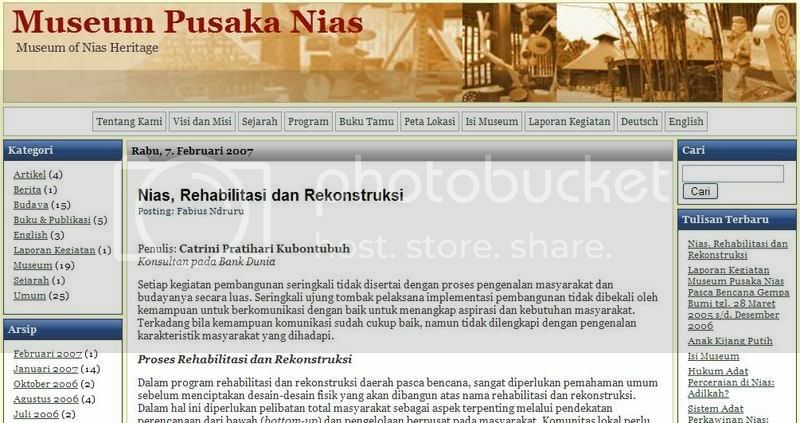 The Museum Pusaka Nias, or the Museum of Nias Heritage has a blog. Although last updated in Feb 07, it still has quite a few articles dating back to 1986 (although concentrated over the last two years). The site is in Bahasa Indonesia, though, and from what I can gather it has updates about its collections as well as the reconstruction of the museum. Nias Island is particularly known for its megaliths. 19 January 2007 (Vietnam Net Bridge) – I’ve got no information on the other stone slabs. A 3 sq. m wide slab of stone believed to be an altar for prehistoric people has been discovered in Xin Man district, northern mountainous Ha Giang province. The stone slab is propped up on three stone pillars, 200m away from a field discovered two years ago full of ancient stone slabs with strange carvings. Archaeologists from the Viet Nam Institute of Archaeology are now studying the significance of the carvings and odd patterns on the stone, to try to come up with ways of preserving them from the ravages of time and weather.